Prior to the release of Rush’s twentieth album, Clockwork Angels, the band had an opportunity to visit with Pete Townshend after receiving the Governor-General Award for Lifetime Achievement in the Performing Arts. The formal gathering provided the Canadian trio with some face time with one of their acknowledged heroes after the event, and the conversation eventually led to the “What’s next?” question. When Rush responded that they were putting the finishing touches on a new album, Townshend scoffed, hinting that the format that he helped secure as a legitimate art form with Tommy has evolved into a seemingly extinct outlet. “Waste of time, making albums these days.” He pointed out rather correctly, and even the band was forced to admit that maybe so, but they had to. You could look at their response as yet another example of a band from a different era failing to acknowledge modern realities. Or you could accept the fact that Rush has operated exclusively in their own reality for four decades now, navigating trends and genres in a silo of loyal fans who appreciate the independent spirit of this band’s history. A big part of that history happened with their 1974 release, 2112, a record that found them at the end of a record deal after three consecutive commercial failures to their resume. By all means, 2112 should have been the band’s clear bend towards their label’s desire to have a hit record. Instead, it’s a record in which half of it is devoted to a concept corny enough to alienate the placid record buyers it was trying to capture. As we know now, 2112 became an enormous record for the band, inexplicably connecting them with an audience who appreciated their excessive tendencies and geeky excursions. It also became the record that fueled their fans’ future expectations, the benchmark for new conceptual meanderings. 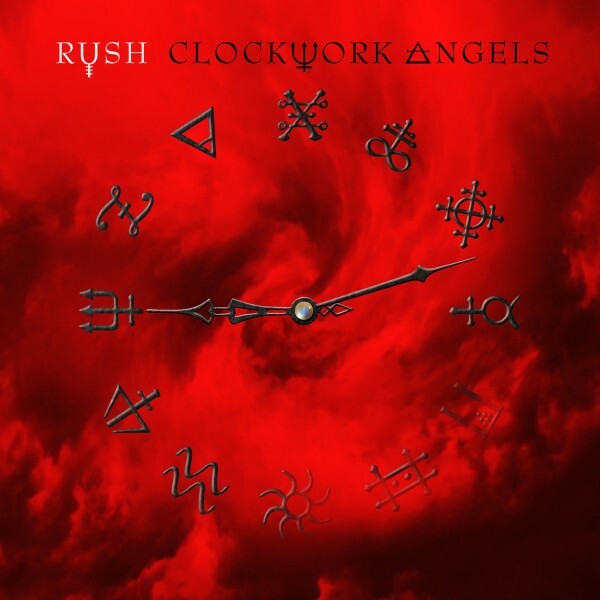 With Clockwork Angels, they’ve returned to idea of a concept album once again, even coyly putting the hands of a clock on the album’s cover, that–if you consider the hands in military time–clearly spell out 21:12. To be honest, I don’t have the patience to figure out what the concept is, exactly; all I know is that I think I heard a few songs reference timepieces and that the performances within the record’s hour-long running time are probably the best thing they’ve done since Signals. It’s also the most varied, alternating between complex arrangements and textures that effectively demonstrate a wide pallet of sounds that could only come from a band that’s spent a great deal of their existence continually trying to move forward. Whether or not you’ve personally been a part of this journey isn’t relevant. Those of us who’ve had a relationship with Rush at some point in our life will find Clockwork Angels to be not only a continuation of the band’s recent upswing, but one of the premier entries in what’s not only been a long, storied career, but a somewhat choppy one at that. The band wisely chose to work with producer Nick Raskulinecz again after giving the band a flattering mix for Snakes & Arrows. His role is vastly expanded here, giving Clockwork Angels a perfect blend of the band’s progressive background with their more recognizable synthesizer years, all while making sure that the material has a distinctively modern sound, capable of scaring off any younger contenders trying to surpass these elder statesmen. They do it by not just focusing on the complexities of their craft, but in casting a wide net over its very definitions. Guitarist Alex Lifeson channels his best Robert Fripp at points where atmosphere and texture rule over guitar worship soloing. The acoustic moments are compelling, and when the material calls for a bit of big power chords, Lifeson responds with memorable attacks and distinctive tones. Geddy Lee’s vocals are more palatable than they’ve ever been, with hints of emotional qualities that were not present when his voice was more of a distraction than an instrument. And speaking of, his bass duties are pushed up high in the mix, suggesting that he’s never stopped building his low-end craft even when his hands left the fretboard for the keyboard. Drummer and lyricist Neil Peart also deliver some of the best work of his career, with the words providing evidence of added focus and his drumming showing signs of intentional spontaneity. Credit Raskulinecz here too, as the pair purposely avoided unnecessary exposure to the songs so that when the time came for Peart to perform the rhythm tracks, he was only familiar with the song’s outline, approaching it with only a basic notion of how he would address each fill or tempo change. Clockwork Angels‘ most telling moment may come with its title track, beginning with progressive layer of atmospheres before turning into churning bit of double-timed frenzy. The trick goes back and forth, until it turns into an acoustic Zeppelin shuffle right around the five-minute mark. It’s well thought-out, expertly delivered, and it suggests that not only are Rush still trying to deliver career triumph to us, they may still be able to accomplish it. “All the journeys of this great adventure,” Geddy sings, looking back on the band’s history and noting the struggles of their early years with “It didn’t always feel that way.” As the track progresses, Lee finally admits, “I wish that I could live it all again,” while the band performs as if the last four decades haven’t slowed them down a bit. Waste of time? Judging from Townshend’s twilight output, maybe. But for the members of Rush, Clockwork Angels is a late career triumph that sounds like the band’s time was put to excellent use. I think this is a really good album, clearly the best Rush recording in years. Best tracks are the title track, “Headlong Flight,” “Caravan,” and “The Wreckers,” but it’s all quite good. I dunno if Nick Raskulinecz was the best choice. For instance, in the song above, after the intro bass part and before the vocals come in, you could tell people it’s a Foo Fighters song and I doubt they’d know otherwise.